DUMBARTON pulled off a great 4-0 win over Raith Rovers at the Cheaper Insurance Direct Stadium and leapfrogged them into seventh place in the Ladbrokes Championship. The 719-strong crowd also saw striker Robert Thomson nets Sons 500th goal at the stadium with his first strike. It was a strong start from Sons, rewarded after just six minutes when Calum Gallagher got in behind his man to set up Robert Thomson for goal no.1 and a place in the club's history (pictured). The pace slowed rather after that. Rovers began to come back into the match, only being denied an equaliser by a remarkable double save from Alan Martin in the Dumbarton goal. Nevertheless, Sons stayed in control of the game overall and Thomson deservedly grabbed his and his team's second as he volleyed the ball into the top corner from a set piece. Dumbarton enjoyed a dream start to the second half when Sam Stanton scrambled the ball in for 3-0, with man of the match Thomson involved in the action once more. 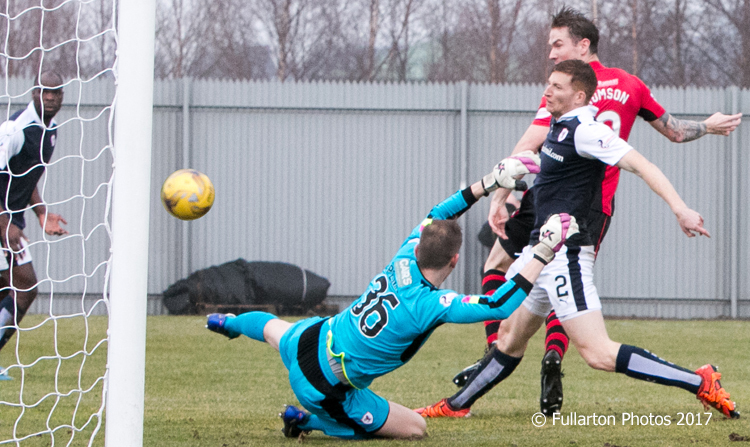 Raith pressed forward with determination for the rest of the half, but Sons were solid and kept them safely at bay. Garry Fleming provided the icing on the cake with a neat fourth goal in time added on, and celebrated by lifting up a ball boy!